It is pretty well known in the Media Room that [A] That I am a big fan of German rider Ingrid Klimke. She always makes a great action picture in all the eventing disciplines and gives every photographer the photo opportunity at the Press Conferences, which she attends on a regular basis as she nearly always in contention at the top of the leader board. 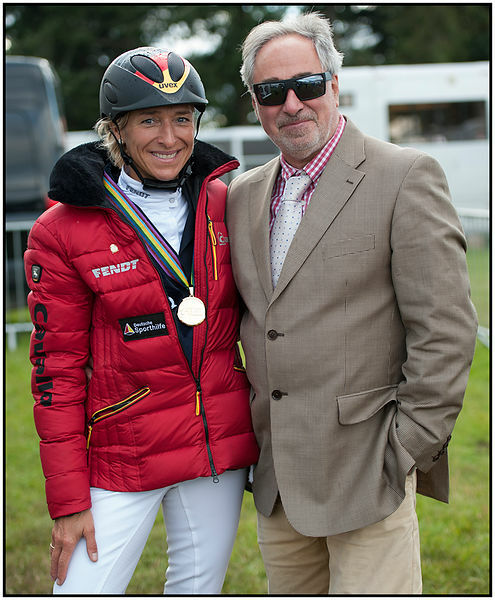 Ingrid along with the German Team are sponsored by UVEX. [B] I am currently going through what could be termed as my UVEX Reflective Period. So given the opportunity [Thanks Libby Law] to add Ingrid to the growing list of top riders reflected in the lens - well sometimes you just have to go for it. What a really nice person to talk to and chuffed she went along with the idea. After the shot she kindly posed for a few photos.